Toyota NS4 plug-in hybrid concept exterior; Credit: © Toyota Motor Sales, U.S.A., Inc.
Top car maker Toyota recently unveiled a prototype plug-in hybrid car, the NS4, which comes with a host of high-tech safety features. The mid-sized NS4 plug-in hybrid concept car, which could be on sale within 3 years, features longer-range when running on electric power and a touch-screen dashboard with automatic safety controls. 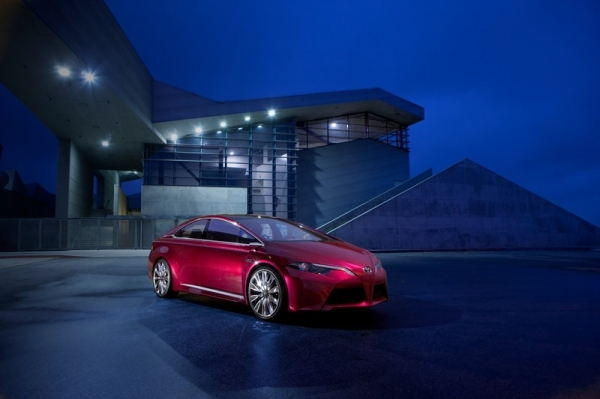 According to Jim Lentz, Toyota president and chief operating officer, "In this digital age, cars are becoming another spoke in the wheel of our electronic connectivity. "NS4 demonstrates Toyota's take on the human connection to the car with technology that considers both emotional and rational relationships, person-to-car and car-to-society." The NS4's Hybrid Synergy Drive plug-in system features improved overall fuel economy, better acceleration, smaller and lighter component sizes and a short charge time. The car's styling is based on the aerodynamics of a modified triangle and has a low height and a cabin that tilts forwards. It features an open trapezoid grille, floating lower spoiler and wing-like daytime running lights all the way to its sculpted fender. The rear lamp wings create a strong edge and the effect of a rear spoiler. 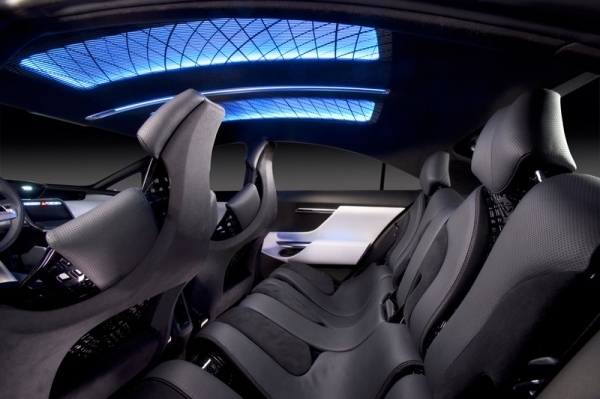 Toyota NS4 plug-in hybrid concept interior; Credit: © Toyota Motor Sales, U.S.A., Inc. The thin A-pillars improve driver visibility but are strong to help protect in accidents. The NS4 includes powered swan-wing doors and an easy lift boot. Toyota has teamed up with technology leaders, including Microsoft, Intel and Salesforce to help create its Human-Machine Interface (HMI), which features a multi-touch screen that looks and feels like a smartphone. They claim it is simple to use and conveys information quickly while minimizing driver distractions. The multimedia and vehicle-controls enhancement also controls air-conditioning, audio, battery-charge and navigation functions. The special HMI system is even capable of "learning" driver preferences and habits to anticipate driver responses. The Toyota NS4 features a next generation Pre-Collision System (PCS), which is designed to predict collisions under certain circumstances and help avoid them. It includes lane departure, rear-end and pedestrian collision avoidance technology. Millimetre-wave radar and stereo cameras on the front of the vehicle detect and react to lane departure, pedestrians and other vehicles. It also emits near-infrared beams for better recognition at night. Toyota NS4 plug-in hybrid concept illustration; Credit: © Toyota Motor Sales, U.S.A., Inc.
PCS identifies objects in the road ahead. If it decides a collision is imminent, the brake assist system is placed in standby mode, a warning is displayed and a buzzer sounds. If the accident is unavoidable, the system warns the driver using a light and buzzer, applies the brakes and automatically activates the driver and front passenger seatbelts. Adaptive Driving Beam (ADB) headlights help prevent glare to oncoming drivers and pedestrians, using a camera behind the front grille and partial shielding inside the headlights. The NS4's pop-up hood automatically raises the rear hood to increase the space underneath that helps reduce pedestrian head injuries in collisions at certain speeds. This has been tested and verified using crash-test dummies and Toyota's Total Human Model for Safety (THUMS) virtual model. Using sub-millimetre wave radar, the NS4's Blind Spot Monitor (BSM) detects a vehicle in the next lane and visually alerts the driver on the upper dash. Four new glass technologies are used in the windscreen, front triangle, door, and rear windows to improve driver visibility, petrol consumption and mileage when in electric driving mode. Fluorine-coated glass causes raindrops to form semi spherical shapes for improved visibility. High performance resin material helps reduce fogging and a high ultraviolet absorbing inner-layer removes 99 percent of harmful UVA and UVB rays. Anti-solar film with radio-wave transparency reduces the internal vehicle temperature and improves the functionality of electronic devices. The inner and outer rear view mirrors are replaced with cameras to give the driver a panoramic rearward view. The rearward image is shown on a dedicated dashboard screen and provides a wider view than conventional rear view mirrors. The rearward panoramic camera view works along with the Blind Spot Monitoring (BSM) system to aid visibility.